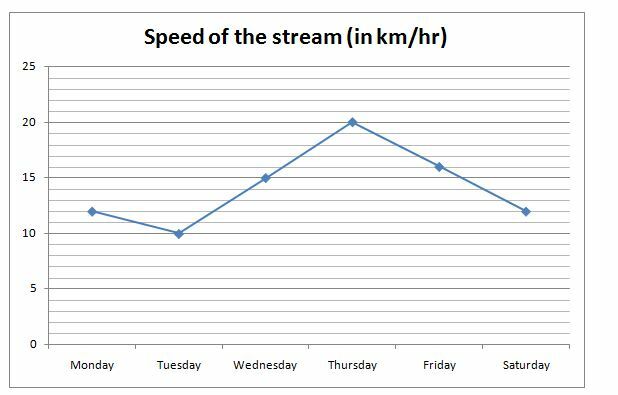 The line graph shows the speed of the stream (in km/hr). 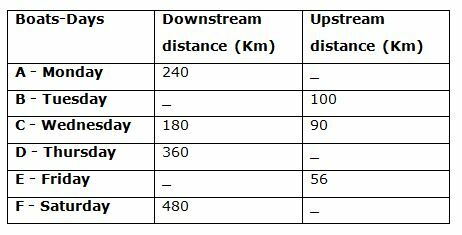 The table shows the distance (upstream and downstream) covered by different boats in same time on different days. Note: Some values are missing, you need to calculate those values if required. 1. In Monday, Sanjana and Ranjana start swimming simultaneously from the two opposite ends of a lake at a speed is same as the boat A’s speed in still water. Sanjana swims along the stream and Ranjana swims against the stream. The distance between the ends is 1200 m and the time taken by Ranjana to swims the given distance is 48 secs more than that of Sanjana. Then what is the distance covered by boat A in upstream? 2. If the speed of boat C in still water is 12.5% more than the speed of boat D in still water and the downstream distance covered by boat E is 40 km more than twice the upstream distance covered by boat D, then find the speed of boat E on Friday? Find the ratio of the upstream distance covered by boat D to the downstream distance covered by boat E? Statement III: The time taken to cover upstream distance by boat E is 1 hour more than the downstream distance covered by boat D which is 6 hour. Statement II alone is not sufficient to answer the question. Statement III: The time taken to cover upstream distance by boat E is 1 hour more than the downstream distance covered by boat D which is 6 hours. Statement III alone is sufficient to answer the question. 5. Find the ratio of upstream speed of boat A to the speed of boat D, if the downstream speed of boat A, C and D is same? 1) In Monday, Sanjana and Ranjana start swimming simultaneously from the two opposite ends of a lake at a speed is same as the boat A’s speed in still water. Sanjana swims along the stream and Ranjana swims against the stream. The distance between the ends is 1200 m and the time taken by Ranjana to swims the given distance is 48 secs more than that of Sanjana. Then what is the distance covered by boat A in upstream? 2) If the speed of boat C in still water is 12.5% more than the speed of boat D in still water and the downstream distance covered by boat E is 40 km more than twice the upstream distance covered by boat D, then find the speed of boat E on Friday? 3) Find the ratio of the upstream distance covered by boat D to the downstream distance covered by boat E? 5) Find the ratio of upstream speed of boat A to the speed of boat D, if the downstream speed of boat A, C and D is same?